Register early, before the conference program is complete and attend the AnyLogic Conference 2019 for only $30! Your conference fee includes two days of conference presentations, networking events, meals and a deluxe attendee gift. 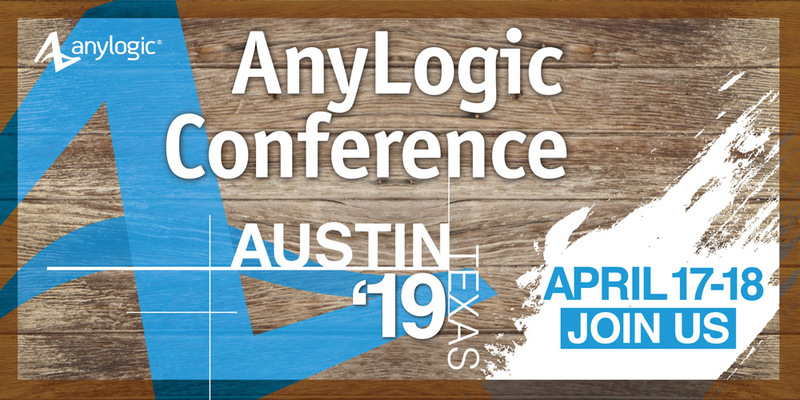 The registration fee for the AnyLogic Conference 2019 includes two days of conference presentations, networking events, meals and a deluxe attendee gift. The fee includes two days of conference presentations, networking events, meals and a deluxe attendee gift. Don't miss the opportunity to see how AnyLogic is being applied across multiple industries, experience innovative solutions, network with the world's most experienced modelers and expand your vision of AnyLogic software. The program is built with the most innovative AnyLogic users from industry-leading organizations and features project presentations and workshops. In conjunction with the Conference, we are holding hands-on software workshops. The entrance is free for Conference attendants. Your conference fee includes two days of conference presentations, networking events, workshops, meals and a deluxe attendee gift. Stay tuned as we continue to build the program and provide further information. "The value I find in attending the AnyLogic Conference, was the multitude of different research and projects that are going on with AnyLogic. It really opened my eyes to some new ideas that we can implement with AnyLogic that we might not have thought of before." - Beth Tyrie, Fruit of the Loom. "It’s great to attend the AnyLogic Conference because you can see how the tool is being applied across multiple industries, get to exchange ideas with people, see how other people are solving the same problems and see what the best approach is." - Artem Parakhine, PwC. "The AnyLogic Conference is a great place to learn more about the product and to receive firsthand information from the AnyLogic developers, as well as practitioners with a huge amount of experience." - Arnd Schirmann, Airbus Group Innovations.